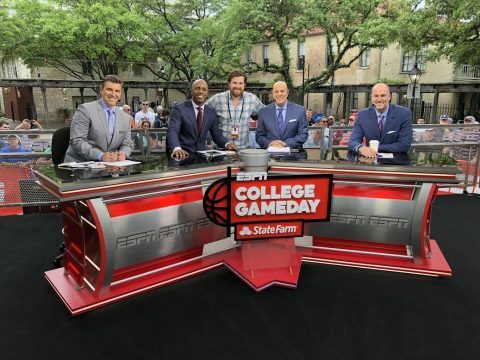 When an ESPN College GameDay broadcast starts Saturday morning during basketball season, most of the hardest work is done for the show’s main researcher. The rest of the week is much busier for Bryan Ives, a 31-year-old UNC alum from Charlotte who is a senior researcher at ESPN. He goes to work on the next broadcast as soon as the location is determined. The location for the final GameDay of the season has been known for a while: There will be Saturday and Monday broadcasts from the Final Four in Minneapolis. Ives’ work started ramping up as the four teams were determined. The broadcasts will be the first since the last regular-season stop in Chapel Hill before North Carolina beat Duke on the Tar Heels’ senior night March 9. Some might judge people who spend a lot of time compiling and analyzing statistics with an unfair stereotype. Yes, he enjoys crunching the numbers. But his job requires that agility to do so much more. Ives isn’t as visible as Chris “The Bear” Fallica, a producer and the main researcher for football College GameDay, who appears on camera for all of those broadcasts. But his researching role for basketball GameDay is very similar. Of course, when you’re working in close proximity to a live television broadcast, you never know when you might end up as part of the show, as Ives did during an ACC Tournament broadcast in Charlotte. Howie Schwab, who gained fame on the game show “Stump the Schwab” before being laid off in 2013, was one of the first researchers for ESPN’s Stats and Information Group. That group now includes Ives and about 40 other production researchers. Although Ives is glad to be on that team, he never anticipated his career path. Ives grew up loving sports, but he wasn’t obsessed with statistics surrounding them in a way that is now part of his daily work out of ESPN’s Bristol, Conn., offices. A history and political science major at Carolina, he really didn’t really think much about a journalism career, and his first job out of college was as a financial adviser for Edward Jones. That job involved numbers, but wasn’t fulfilling. That blog was Thrown Away to Worthy, where he wrote sports commentary for 4½ years beginning in 2011. He also wrote and reported for Inside Carolina for a little more than a year starting in early 2012. That further stoked his interest in writing, and led him to pursue a master’s degree in journalism from Northwestern, which he earned in 2013. “I started a blog out of college because I wanted to write about sports and all of that. That was sort of the impetus for it,” said Ives, who conceded that he probably should have studied journalism as an undergrad at UNC. The name of that discontinued blog is similar to his Twitter handle, @awaytoworthy, and shows that he doesn’t hide his love for UNC. It’s a reference to Woody Durham’s radio call in the 1982 national championship game when Georgetown’s Fred Brown threw the ball away to UNC’s James Worthy. Ives embraced those words despite that call happening six years before he was born. “That Woody Durham call is classic, so everybody got a kick out of it when I started it,” Ives said. He spent seven months as an editorial assistant in Charlotte for Sports Business Journal after Northwestern. He then formed the bridge to his current job working a part-time job for ESPN in Charlotte as a researcher when the SEC Network launched. It was part time in that there were no benefits, but he averaged about 39 hours a week. After 18 months working in Charlotte, he moved to Bristol in May 2016, just a few months after becoming full time. With his family and his wife’s family all living in North Carolina, it was a bit of an adjustment, as was as dealing with the colder weather. But he says it was all worth it to work in a job that he loves. Once the GameDay site is determined, usually by Saturday evening of the previous weekend, Ives prepares a package to send via email to the ESPN’s college basketball brass, the announcers and the entire production team, including producers and the production assistants. “Sunday, I will compose this big, pretty lengthy email with my thoughts on this upcoming week in college basketball. Notes, stats, trends with an emphasis on our game on Saturday. Where we’re going,” Ives said. It’s a comprehensive package that focuses on the teams playing at the GameDay site but also includes broad college basketball themes. “I’ll do a lot of history of those games,” he said. “I’ll do what these teams are good at, any cool anniversaries coming up, things like that. 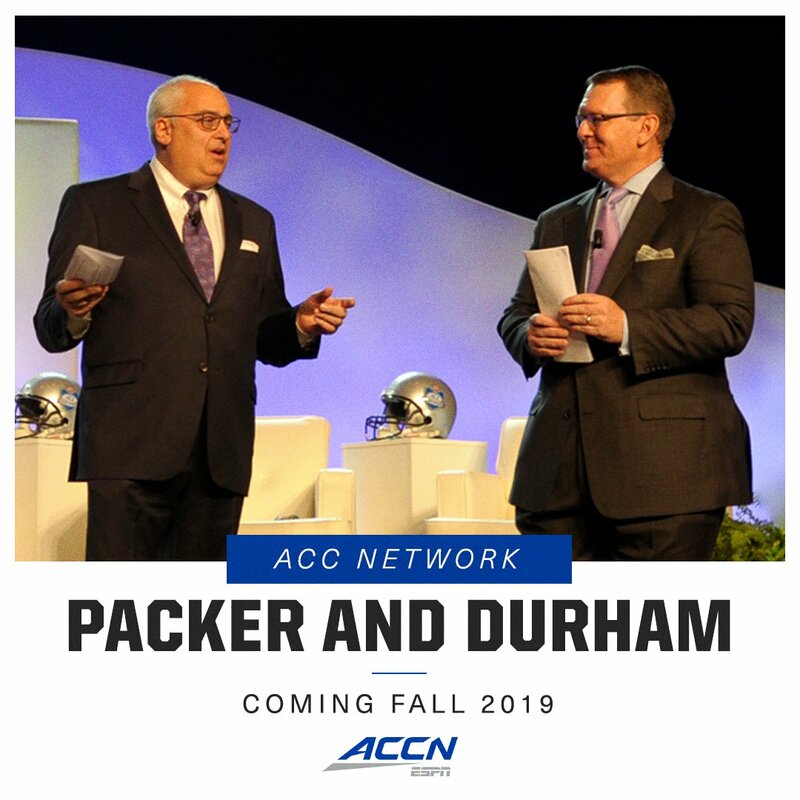 Although his duties are focused on GameDay during the basketball season, he’ll get his share of basketball questions during the week that may not have anything to do with the GameDay show or matchup from the show’s four announcers. When Ives arrives in the GameDay city early Friday morning, his focus shifts a bit. “I’m doing graphics, I’m writing scripts for the show. I’m doing a lot of that, sort of clerical work later in the week,” Ives said. While Davis writes a lot, much of what he conveys comes from Ives. Whenever there’s a voiceover, chances are that Ives wrote that. “If there is some sort of historical flashback, I will have written that and details for each game. I will have provided the content. I do write a lot of stuff. All that historical flashbacks and full-screen graphics that have stats and stuff, I will have written and helped to build it as well,” he said. Ives also helps with football GameDay, but he doesn’t travel to the broadcast site each weekend. ESPN announcers have access to databases and websites that the public can’t see that provide well-researched analysis that you’ll hear about on broadcast and see ESPN personnel tweet. During football Saturdays, many ESPN writers are on a SlackChat group. They’ll ask Ives and others questions and quick answers are provided. After the Final Four, his focus can go any number of directions. But, for now, he’s getting ready for Saturday’s GameDay broadcast in from Minneapolis. 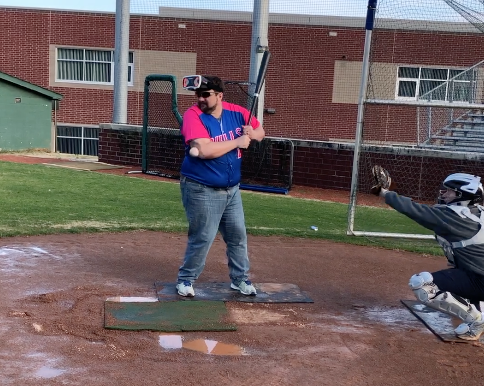 Numerous area sports journalists won North Carolina Press Association awards last month. Andrew Carter of The News & Observer and The Herald-Sun won the Thomas Wolfe Award for writing for his this story on the Wallace-Rose Hill football team in the aftermath of Hurricane Florence. 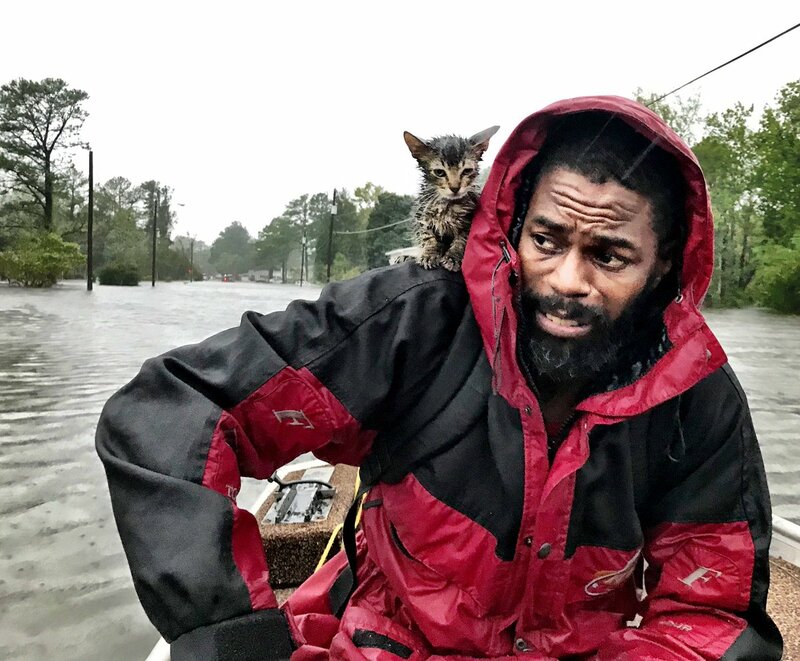 Carter also won photo of the year for this shot of a kitten on a man’s shoulder after Florence. At The News & Observer, in Division F (over 35,000) Barry Jacobs won in the sports columns category (three were submitted). Earning second-place honors were Carter (sports enterprise writing for his series on Woody Durham), Luke DeCock (sports feature reporting for his story on Gov. Roy Cooper’s Carolina Hurricanes fandom). Garnering third-place awards were the staff (sports coverage), Steve Wiseman (sports news reporting for story on the effort to save the life of South Carolina State’s Ty Solomon) Dan Kane (sports news reporting for story on UNC challenging the NCAA’s jurisdiction) and Ethan Hyman (sports photography for a locker room celebration shot). At the North State Journal, under Division A (under 3,500 circulation in the community newspaper division), first-place awards went Shawn Krest (sports column awards for a columns on Jay Bilas and NCAA rules) and Brett Friedlander (sports enterprise writing award for story on cricket, a sports news reporting award for story on Dale Earnhardt Jr. and a sports feature writing award for “Clays 4 Kay”). Second-place honors went to Cory Lavalette (sports feature writing for a USA hockey story) and Krest (beat feature reporting for “A Hunter’s Best Tool” and “Punt or Gamble.” Krest also won two third-place honors (sports feature writing for a story on PNC Arena transforming from basketball to hockey and sports enterprise writing for “Recruiting at North Carolina”). At the Charlotte Observer, under Division F, Scott Fowler won for lighter columns, for sports columns and sports news reporting (for a story after the death of legendary NASCAR writer Tom Higgins), and Brendan Marks won for sports columns. Second-place honor went to Théoden Janes (sports enterprise writing on a dangerous 3-mile stretch to ride a bike) and Langston Wertz Jr. (sports news reporting for a story on the death of a player’s father). Jourdan Rodrigue got a third-place honor for sports columns and the staff finished third in sports coverage. The News & Record won for sports coverage under Division F. Jeff Mills won a second-place honor (profile feature, “A Broadway Masterpiece”). Third-place awards went to Brant Wilkerson-New (sports enterprise writing for a story on Marvin Bagley), Mills (best lede, based on three submissions, and a profile feature award for a story on John Isner) and Joe Sirera (best multimedia project for “Excellence personified.”) Photographer H. Scott Hoffmann won for a shot of a dunk in a UNCG game. At the Winston-Salem Journal, under Division F, winners were Patrick Falise (sports enterprise writing for a story on the Bowman Gray track and sports feature writing on a West Forsyth hall of famer) and former Herald-Sun photographer Walt Unks (sports feature photo from West Forsyth playoff game). Earning a second-place honor was John Dell (sports feature writing on a middle school girl overcoming physical challenges.) Earning third-place honors for sports photography and sports feature photo was Allison Lee Isley. The Journal earned second-place honors for sports coverage. At the Fayetteville Observer, under Division E, winning first-place honors were Sammy Batten (sports enterprise reporting, “Game Changers: The Rise of Football in North Carolina) and Batten and Hrisanthi Kroi (best multimedia project, “Game Changers.”) The staff won second place for sports coverage. Earning a third-place honor were Jaclyn Shambaugh (sports enterprise writing, “Cumberland County takes stops to bar ‘hot’ bats” and sports news reporting, on Jeff Capel Jr.’s death) and Rodd Baxley (sports columns)..
At the Wilmington StarNews, under Division E, Alex Riley, who left the newspaper last month become communications coordinator for Pender County Schools, won first-place honors (sports columns; sports news reporting on UNCW baseball). In The Athletic, James Fegan writes that Carlos Rodon, the former N.C. State pitcher who was the Chicago White Sox’s Opening Day starter, always had that “it” factor and just wants to show he’s good enough. There have been many good profiles of UNC freshman point guard Coby White focusing on his relationship with his father, who lost a battle with cancer in August 2017. Two of the best were this one In The Athletic by Brian Hamilton and this one in The N&O and Herald-Sun by Jonathan Alexander. In The N&O and Herald-Sun, McClatchy’s Brian Murphy takes a look at how shoe companies straddle the line between support and scandal in college basketball. In the Athletic, Joseph Person profiled Carolina Panthers quarterback Kyle Allen, who is looking bigger and stronger and definitely doesn’t lack confidence. Why do so many basketball players wear tights under their uniforms? Carter looked into that for The N&O and H-S. Need ammunition in arguments with out-of-staters to prove that North Carolina is the king of college basketball? David Glenn provided plenty of it in this story.